Need inspiration and motivation to lose weight? Read this true story written by my friend. 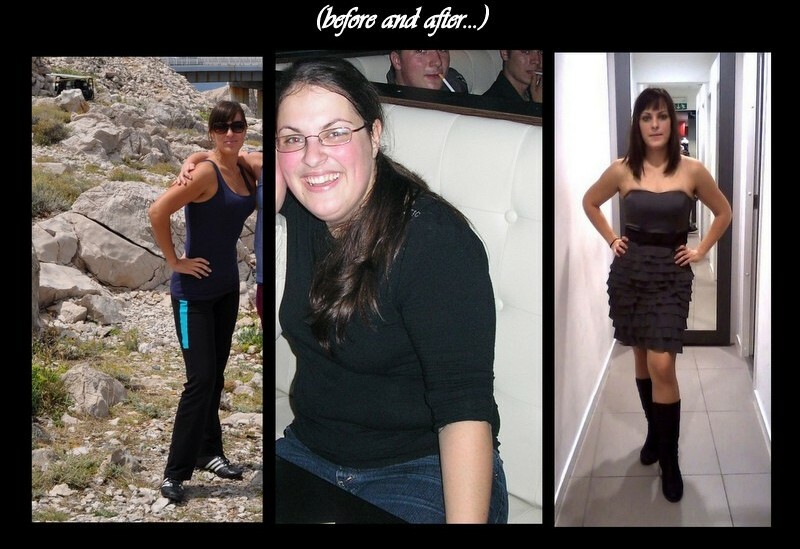 Much thanks to Svetlana who sent in her motivational weight loss success story. It all started when I got my period and all my hormones were just spiralling out of control. Eventually I realised I lost all control and food was controlling my life. Like many others in the same situation I was being judged by the public for being overweight, judgmental looks and insulting comments were just a part of my ordinary day. You wouldn’t believe how rude people can be, even adults. I was caught in a vicious circle of bad eating habits and was eating for all the wrong reasons; instead of eating when I was hungry I would eat when I was depressed and sad. One day I had a doctor’s appointment, he checked my blood pressure and I had to face my worst enemy, the scale the ultimate truth teller. I was told that with my 19 years and 220 pounds and extremely high blood pressure, I had to loose weight or I would end up in a hospital. The number was so high and I was so miserable, that my best friend said to me: “Stop whining, if you’re so unhappy and do something!”. At first I was a little mad at her but it did the trick, that whole summer I would run every day. It was hard, and every day I would face and fight my demons and that little voice in my head that was so used of telling me that I couldn’t do it. But every day I could run a minute, two or three longer, my breath wasn’t so bad, I found my pace and I would constantly repeat these words in my head : “I can do it, just a little more, you are almost there”. That summer I lost 44 pounds gained some confidence and discovered that when I was passed the hard part, I actually loved to run. Right after my weight loss I went to college and managed to maintain the weight, but I discovered that even though I would still run and be active the weight remained the same. After my diploma and moving back home last year I realized I had to completely change my eating habits and that was the biggest challenge ever. A friend gave me a book by Dr. Arthur Agatson, called South Beach diet, and told me to read it before I judged it. I had nothing to lose (but the weight :), so I read the book, loved it, learned a lot of useful information about what a certain food groups does to our body and why do we gain weight. On December 2010, with 180 pounds (82kg) I decided to go on the diet, I survived it, my stomach got smaller, I didn’t crave sugar anymore, I learned to listen to my body again and most importantly I learned how to chose, combine and cook healthier meals. After two months of food organizing I started with fitness. I started to write a diary of what I was eating, so it could keep me motivated and I could stay on track, I did the same with my workouts. And it was the combination of the right food, with a big amount of cardio workout (manly treadmill and running outside), basic exercises to gain some muscle power (squats, push-ups, sit-ups) and a lot of positive thinking. Time passed and I was so focused and caught up with my workouts, and high on the progress and the strength I gained I wasn’t even focused on the weight anymore. After five months I could run 20km, without stopping. I learned that the hard workouts gave me, what I was looking to get from food, satisfaction and a lot more: confidence, will power, positive energy and a better way of dealing with my feelings. I learned how to focus my negative and positive feelings and energy and use them as a fuel for my workouts. I lost another 44 pounds (20kg). This was my first time after my childhood that I reached 136 pounds (62kg). I have traveled form an evil XXXL, XL, L, M to a happy S size. I could finally wear pretty stylish clothes and not just those I could fit in, tank tops, shorts, and oh so scary bathing suits that were not so scary anymore!! I learned that I didn’t want to be skinny but fit and healthy. And now even though being fat and losing weight was the hardest thing I ever hade to do I realize, It was a blessing in disguise. Now I know, I am the one who has to love me, I have to believe in my dreams and goals and most importantly I have to change the things that I don’t like in my life. Now I am working at a local fitness center as a personal trainer, and I am mentoring and motivating a group of girls that are struggling with bad eating habits and want to lose weight and are currently going trough the South Beach diet. Be responsible for your own life, happiness and body and take control. It’s never too late to become, who you were meant to be!